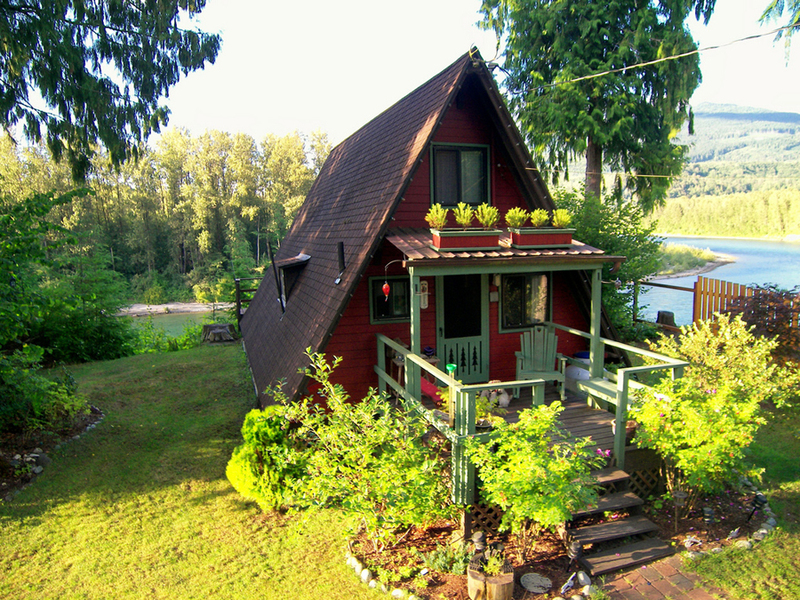 Small A-Frame cabin in Concrete, Washington. Photo by Chris Barnes. The house is cute, but why would someone orient this house like this and not take advantage of the spectacular view? Turn it 90º and you look out at the lake. Someone was not paying attention! I think it is perfect Emily I am sure it has a huge deck off the back with a slider from the Bedroom so they can lay in bed and look at the view, wake up to it in the morning… Awesome! all I can say is amazing! Would love to live there. I love it. It looks almost like a postcard it is so cute. And to be curled up in front of that fire….. wonderful! What a beautiful little house! It’s in a beautiful setting too. OH MAMMA!!! I would be in seventh heaven if I could win this…. please please please 🙂 I would be moved there within a week!! Wow! That one indeed made me swoon! I love the name of the town, too. Concrete. Love it! Looks so peaceful!! Interior pics please? 🙂 This is adorable! I would love to see more interior photos of this. It is darling! This is awesome! I would love building plans to this little gem! Very beautiful houses- How much does a house like that small is worth I wonder. I don’t see the flue above the ridge line for the wood stove. That is a must. The propane back up is a smart idea for cooking and water heater; comment about flue applies here as well. Where is the firewood supply kept out of the weather? Is there a back up generator if the AC grid is damaged during a winter storm.? Nice. Would love to see some detail on the interior. 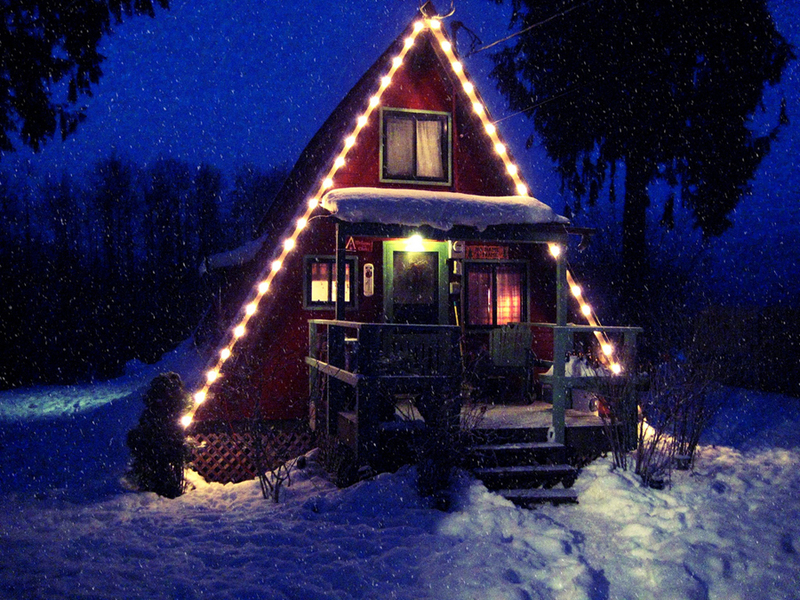 What a cute little house, looks like the type of place you would grab a cup of hot chocolate and enjoy a book. I would love to see the interior. 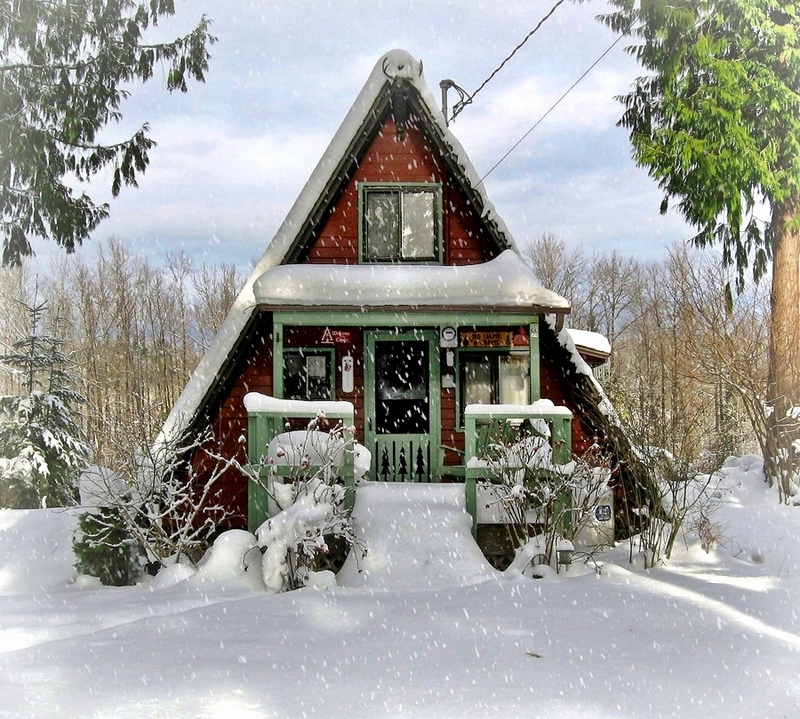 This is a really adorable little A-frame house! I love that you took pictures in all the seasons 😀 thanks for sharing! Great Tiny House but it would have been nice tsee more of the inside. delicious! what about the inside? I have always been a person who believes in living simply, all anyone needs is a warm stove, a simple shelter, and a wonderful 4 legged friend and peace and quiet. I have always loved A-Framed houses, I think that they are the perfect design for living. I love this one the best, it has everything to make anyone extremely happy and make life worth enjoying….